In many parts of Italy, and among Italian-Americans, there is something very fishy about Christmas Eve dinner: the traditional Feast of the Seven Fishes is a veritable seafood parade of fish dish after fish dish. 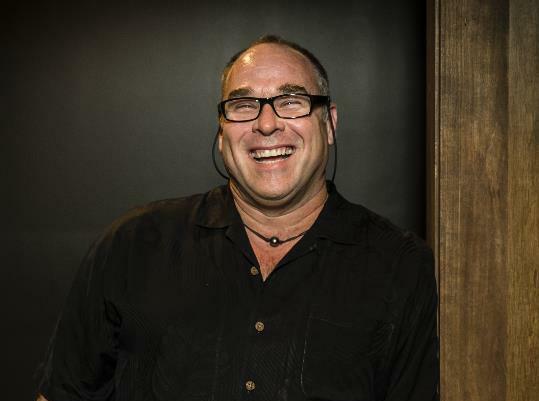 Just in time, Robert St. John, seasoned chef-author-columnist, has launched a book of Italian cooking this November, An Italian Palate [Different Drummer Press, 2013,] that will make the preparation of such a feast not only less daunting, but a true festive pleasure. An Italian Palate is the result of a six month sojourn in Europe for St. John, and homeschooling venture abroad for his two children. 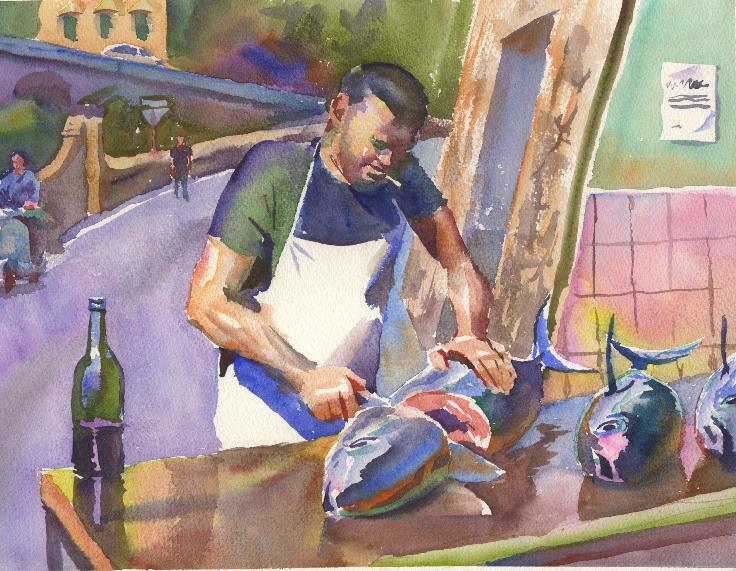 St. John’s close friend, Wyatt Waters, tagged along for the Italian excursion, and his glowing watercolors illustrate the pages of the cookbook. Each of St. John’s seafood dishes makes a fine meal of its own, but together, they give a whole new meaning to “Bounty of the Sea.” On Christmas Eve, as on other feast day vigils, observant Catholics refrain from eating meat, but they will still make a glorious feast of fish. Why seven? The Catholic numerology is complicated and debatable. 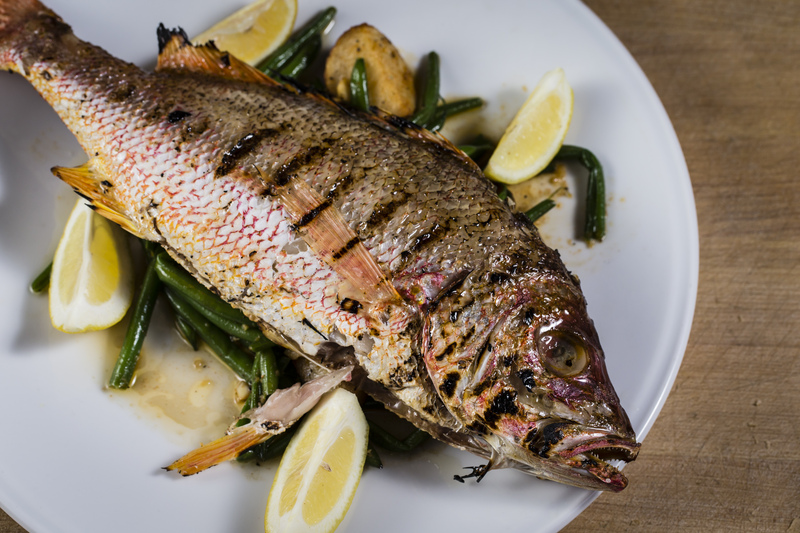 That Robert St. John’s An Italian Palate is all you need for a fish feast of your own, is unassailable fact. With the Italian peninsula surrounded by no fewer than five seas, the recipes he shares in this luminous new publication reflect a full range of this marine bias. From a Salt Crusted Fish [preferably sea bass] from the island of Burano, near Venice, to the Amalfi Fish Stew, and a shrimp-laden Orecchiette Ostuni, named for a town overlooking the Adriatic, the seafood dishes keep coming — just like the Feast of the Seven Fishes. St. John walks you through the preparation of Fried Anchovies with Sage, and Poached Fish with Olive Oil and Lemon and Lobster Risotto. He regales you with anecdotes about the Calamari Salad and the Sicilian Tuna Salad. He includes a recipe for fish stock that will become the base of many fish dishes, and assures you that a good quality tin of Italian tuna is a fine, and perfectly authentic, substitute for fresh. Most of all, he shares his love of the Italian people, their customs, and their cuisine, seafood and all. This entry was posted on November 20, 2013 by Simone in Uncategorized.